Hops flowers have a calming effect on the body and have been used to relieve insomnia and anxiety when nervous tension has taken its toll. Hops have been used for many many years in TCM for digestive problems, various types of intestinal or bowel problems. The many conditions it treats include nervous or irritable coughs, irritable bowel syndrome, excitability, sleep disorders, restlessness, hyperactivity, hysteria, fits, delirium tremens, toothache, earaches, painful or absent menstruation, and externally used to treat crural ulcers. 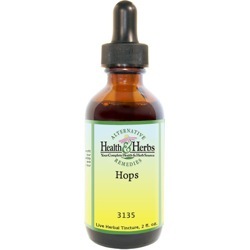 Hop's chemicals have anti-infective activity and anti-cancer properties, which are important to the immune system. Hops have been used in Traditional Chinese Medicine (TCM) for the treatment of numerous forms of leprosy, pulmonary tuberculosis, and acute bacterial dysentery. One of the active components of Hops herbal extract demonstrates antiviral effects against cytomegalovirus, HIV, and herpes simplex virus type 1 and 2. As a tonic for the liver, Hops are thought to increase the flow of bile, and the herb was used historically for liver afflictions, such as jaundice. Hops are used as a diuretic and believed to relieve water retention and excess uric acid, which can lead to gout. For women who suffer from serious menstrual discomfort, Hops Flower extracts may offer relief. Hops flowers are traditionally used as the main ingredient in beer and have naturally occurring sedative properties. Hops are used as a sleep inducer and have become popular among people troubled with sleep disorders or insomnia. Its sedative effects are particularly useful when this tension leads to restlessness and headache. It has also been found to be effective for nervous exhaustion or tension and nerve pain. Hops are sometimes combined with Valerian to make a powerful supplement that can help you to relax, sleep more soundly and alleviate mental conditions, helping to promote a feeling of calm and peace during times of stress. As a further demonstration of soothing the body, Hops tinctures are excellent for the digestive system, calming the smooth muscle and easing muscle spasms (supporting the herb's historical use to treat cramps and menstrual pain). The bitter principle in Hops flowers are considered a fine stomachic and tonic that stimulates gastric juice secretion, which promotes good digestion, relieves and expels flatulence, eases colic, nervous stomach, intestinal cramps, indigestion and nervous intestinal complaints. When Hops flower extracts are sometimes combined with Plantain and Chamomile, the herbal combination has even been known to help treat IBS naturally. Hops are also beneficial for loss of appetite and may be helpful for those who are recovering from illness. Hops are considered to be a relaxant for the gastric nerves and have shown to have a relaxing influence on the liver and gall duct and a laxative effect on the bowels. The concentration of antioxidants found in Hops flowers has been found to be as beneficial as that found in red wine. According to the Memorial Sloan-Kettering Cancer Center, Hops may inhibit the formation and growth of tumors. Researchers have studied the effects of the extract of Hops flower and found evidence that suggests the flavonoids found in the herb may cut the risk of breast cancer, ovarian cancer, and colon cancer. These flavonoids neutralize free radicals in the body, which can promote early aging signs. A ten-year study found that the strong antioxidant effects of the polyphenols may help to reduce the incidence of Alzheimer's disease. Hops act as a diuretic and therefore may decrease bloating and water retention, which corresponds to weight loss. It can also aid in digestion by increasing stomach secretions. However, Hops flower extracts also increase the appetite, so if decreasing the intake of food is the goal, this herb may not be right for those who are trying to lose weight naturally. Hops are believed to have estrogenic activity, and laboratory studies have indicated it is helpful in treating symptoms of menopause, such as hot flashes, sleep disorders and other problems related to lack of estrogen production in women. And studies claim it is useful in treating dysmenorrhoea and amenorrhoea with an anti-oxytocic property. Some experts claim that Hops flowers have a potent effect on neuralgic and rheumatic pains, by inhibiting inflammation. Hops have anti-spasmodic properties that can be helpful for muscular irritability and twitching, by inducing a calming effect. This appears to be helpful for those who suffer from nerve pain, and early clinical research suggests that it reduces symptoms of rheumatic diseases, such as osteoarthritis, rheumatoid arthritis and joint stiffness in fibromyalgia. Another finding was that Hops flowers may help to fight bone loss, and even prevent reverse the process. Hops compounds have also been shown to reduce triglycerides and free fatty acid levels, therefore they may have additive effects with cholesterol-lowering herbs and supplements such as Green Tea liquid extract or Shitake Mushroom liquid extract, and with cholesterol-lowering medications, such as lovastatin or atorvastatin. With its antibiotic properties, Hops flowers herbal tincture is found to be beneficial for sore throats, bronchitis, infections, high fevers, toothaches, and earaches. Although Hops herbal tincture is strong, it seems to be safe to use. For inflammation, boils, tumors, and swelling, a poultice of Hops extract are recommended. The extract of Hops flower is capable of hastening the healing of different skin conditions such as itching skin rashes, hives and slow-healing old chronic ulcers, extremely dry, cracked skin, leg ulcers, herpes, eczema, wounds, and bruises. For treatment of problems with dandruff, the herbal remedy can be rubbed into the scalp, then shampooing the hair with shampoo and rinsing with plain water. This herbal treatment will aid in preventing and controlling dandruff and flaky skin in the scalp. Ingredients: Hops Flower, Structured Water, 20% Alcohol. Non-Alcohol: Hops Flower, Structured Water, Vegetable Glycerin. Instructions: Use 6-12 drops in juice, water, under the tongue, or as desired. May be taken 3 times daily. Shake well. Store in cool, dark place. Keep out of reach of children. Contraindications: Pregnant women should not take Hops, nor should people who suffer from depression, since the herb is thought to be a mild depressant on the higher nerve centers. Do not exceed recommended doses, and Hops should not be taken for more than a few days in succession. Since there appears to be estrogenic activity in Hops, it is recommended that the herb should not be taken in combination with medicines such as oral contraceptives or hormone replacement therapy; and children who have not reached puberty should not take Hops. Women with estrogen-sensitive disorders, especially estrogen-dependent breast cancer should avoid this herb. Use of Hops increases the potency of anesthetics, anxiety drugs, anticonvulsives and insomnia medications and should not be taken without first consulting a physician. Do not use Hops if you drink alcohol or use medicines containing alcohol.